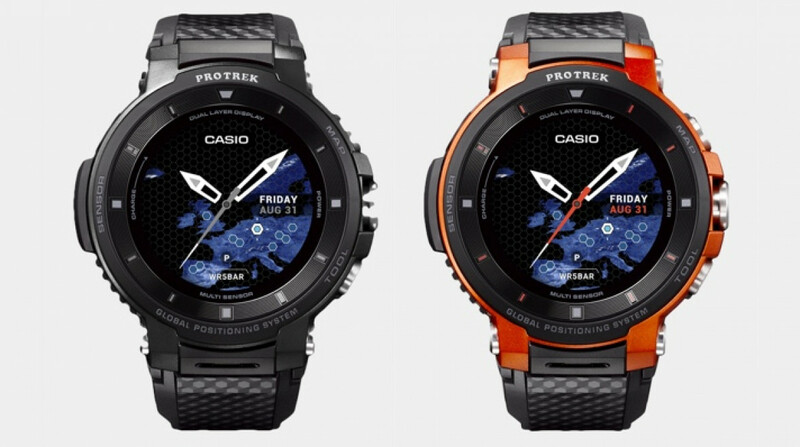 Casio is back with the third instalment of its Wear smartwatch and it's still all about tracking in the great outdoors. The WSD-F30 is the successor to the WSD-F20 and once again falls under Casio's Pro Trek Smart series. It packs built-in GPS and the ability to access maps while offline. The big deal here is that, unlike the F20, you can now use those key features for a lot longer, with battery life up from a day to three days if you use the all-new Extend Mode. Extend Mode displays time and measurement on the watch's secondary monochrome display with a color map viewable when you hit one of the physical buttons. According to Casio, that's based on using GPS and viewing maps for eight consecutive hours a day to get that improved staying power. If you don't use Extend Mode, you'll get 1.5 days of battery life – not dissimilar to the previous ProTrek smartwatch. Speaking of the 1.20-inch dual-layer display, Casio has made improvements in this department, too, with the new 390 x 390 pixel colour OLED display apparently able to show maps and data in finer detail. The power-saving monochrome display will now show more information beyond the time. You'll now see atmospheric pressure, altitude and compass bearing. Building on the Timepiece mode featured on the last Pro Trek smartwatch, you can now see the additional data mentioned above on the monochrome display while still getting a month's worth of battery life when the colour display is not in use. We're glad to hear that Casio has managed to shave some of the bulk off its Wear smartwatch, although it's only 0.4mm thinner than its predecessor. The watchband is apparently more flexible as well, making it a more comfortable fit around the wrist. It still boasts all the same military grade shock and dust-proofing and as the F10 and F20 – with 50 metres of water resistance - as well as features for advanced mapping (which users can download in advance, and use to track position and heading without cellular coverage) and atmospheric pressure, with a barometer, altimeter and compass built in. The ProTrek WSD-F30 boasts apps for activities such as trekking, riding, swimming, golf, fishing, surfing – which helps it stand apart from even the Garmin Fenix range of outdoor watches. At the press conference at IFA 2018, we heard from app partners, and Casio is putting more emphasis on leveraging the Wear OS's ecosystem for sports. App partners include Viewranger (a previous partner) for detailed mapping, and golf app Hole 19, which is introducing a standalone app, adding hole maps on the watch, and advanced scoring. Casio has also partnered with Glassy (surf tracking), Fishbrain (fishing), MySwimPro (swimming analytics), Equilab (horse riding) and Exercise Timer (gym workouts). The WSD-F30 is set to be available in orange, blue and black shades. There's no news on pricing or availability, but we'll update this story when we know more. We'll also be getting some hands on time with the new Pro Trek out at IFA to find out if it makes a good first impression.